Days of Our Lives (DOOL) spoilers reveal that one NBC soap star has exciting new project in the works. Over the past few months, Stefan DiMera (Tyler Christopher) has certainly has his fair share of creepy Days moments. His portrayer does a great job at roles with a dark edge, so he decided to take on another one. Christopher just wrapped up shooting a creepy scene in a new sci-fi suspense flick. 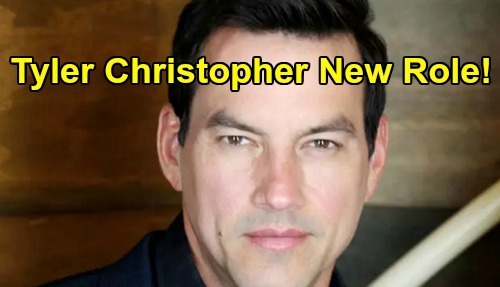 General Hospital fans are hoping Tyler Christopher returns to GH as Nikolas Cassadine, and soon! On Instagram, Christopher posted a picture from the set. This thrilling movie’s called Max Winslow and the House of Secrets. It’s about a mansion owned by Atticus Virtue, a presumably disturbing scientist and entrepreneur. This mansion serves as a battleground for five teenagers who are forced to put their hacking skills to good use. A super computer called HAeL controls everything in this house of secrets. HAeL undoubtedly exposes plenty of them as the teens go up against each other. They have to beat this computer and each other for the ultimate prize: the mansion itself. Of course, they should probably be careful what they wish for. From the sound of things, owning this spooky mansion may not be the best idea! Christopher’s role in this film is currently unknown, but a picture’s worth a thousand words. His Instagram photo suggests he’s most likely playing the father of one young hacker. Christopher is standing next to a woman and a teen boy, so it all adds up. The three of them are sporting some spine-chilling looks and the filter they used is definitely ominous. If you’re into suspenseful movies with some sci-fi twists, this is the perfect fit. If you’re a Tyler Christopher fan, that’s even better! It’s nice to see Christopher taking on some new roles since he departed Days of Our Lives. Due to DOOL’s advance filming schedule, there are still more of Christopher’s scenes left to play out. However, Days viewers will see a Stefan change at some point. Brandon Barash, a fellow General Hospital alum, took over the part and will make his debut as Stefan eventually. Days of Our Lives spoilers say Stefan has some interesting storylines coming up, so stay tuned for all the drama. Meanwhile back at General Hospital Tyler would be more than welcome according to fans on social media – do you think he’ll return to GH? We’ll give you updates as other news emerges. Stick with DOOL and don’t forget to check CDL often for the latest Days of Our Lives spoilers, updates and news. Days of Our Lives Spoilers: Battle Over Holly Begins – Who Will Raise Nicole’s Daughter?